It is most likely that you have agreed to download CalendarSpark onto your computer yourself. It does not propagate itself, and it is unlikely to enter your PC silently. Despite this, some users believe that it can act as a browser hijacker. Were your browsers’ settings modified, and a suspicious search engine launched as your homepage after downloading this toolbar? Firefox and Internet Explorer users have to accept the homepage and new tab modifications if they want to install the program, which is why it is unlikely that these modifications can be made without your permission. Of course, if you are completely sure that you have been tricked into downloading this software or if it was installed without your permission, you need no other reason to eliminate it from your PC. 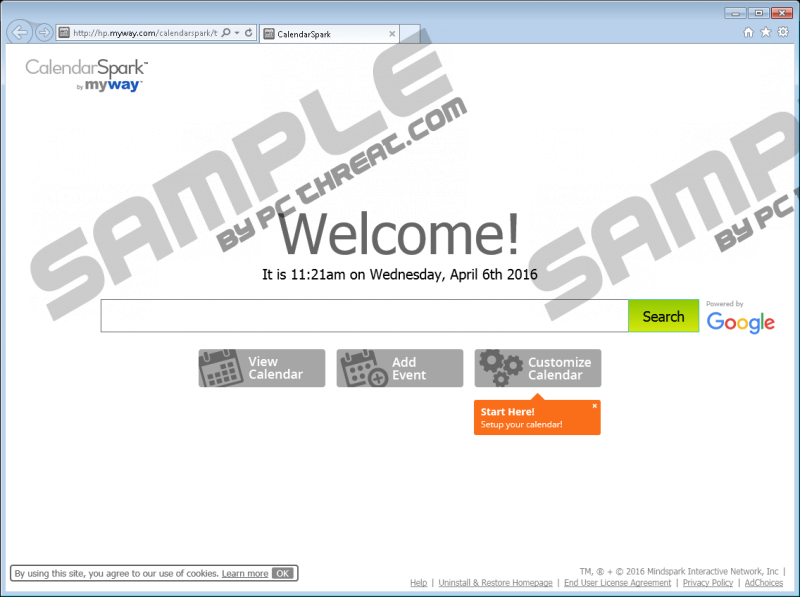 The removal of CalendarSpark is easy, and our guide will assist you in every step of the way. CalendarSpark is similar to EasyPhotoEdit Toolbar, MyFormsFinder Toolbar, Wallpapers Toolbar, and hundreds of other toolbars created by Mindspark Interactive Network. Although it is suggested that MyWay is the company responsible for this application, the official developer is Mindspark. According to our research, computer users can download this program from free.calendarspark.com/index.jhtml, as well as chrome.google.com/webstore/detail/calendarspark/apfkjcjglfhoemadfobgcacfkdhapiab. As you can see, the latter link represents Chrome web store, and this installer is only compatible with Google Chrome. If you download this program onto your Chrome browser, you will be able to get rid of it by removing the undesirable extension. This operation is more complicated for IE and Firefox users. Luckily, it is unlikely that different browsers on your PC will be infected at the same time because the app is installed on one browser at a time. Of course, this does not change the fact that we still recommend eliminating it from your browsers. Most users of CalendarSpark are located in India, Pakistan, Algeria, Egypt, and Indonesia. This might be due to the fact that users in Western countries are more informed about Mindspark software. Despite this, it is possible that this strange program will enter your operating system if you live, for example, in the United Stated as well. Although it is most likely that you have downloaded this toolbar using its official installer, it is also possible that third-party downloaders will attach it to other programs. If you have downloaded this app packaged with other suspicious programs, you need to eliminate them timely as well. Even if you do not suspect the existence of malware, it is wise to spare a few minutes for a full system scan. It is very important to know what kinds of threats exist on your PC to ensure successful removal, and, unless you install anti-malware software, it takes skill and experience to detect all active infections. Search.myway.com is the search tool that is represented via CalendarSpark. This application provides tools that are meant to help you create calendars and add events, but it seems that the main objective is to promote this search provider. If you use it, you will be exposed to sponsored links. On top of that, information about your virtual activity will be recorded. Most users do not think that having their browsing history recorded and analyzed is dangerous, but our researchers warn that this information could be used to design more deceptive scams. Overall, CalendarSpark is more unpredictable than malicious, and it is the search tool that is associated with it that raises most questions. Because this search tool is not reliable, we advise eliminating it right away, and, of course, we believe that you should get rid of the extension along with it. Which browser are you trying to delete CalendarSpark from? This matters because every browser has to be approached differently. For example, Internet Explorer users will have to uninstall the unwanted program via the Control Panel, while Firefox and Chrome users will need to go directly to the browsers. The guide below shows how to erase the unwanted program, but manual removal is not the only option. If you realize that your PC is vulnerable – and it is – you might want to install anti-malware software. If you install it, you do not need to waste your time eliminating suspicious software manually. Do not hesitate to ask us questions if you have any. Scroll down to the comments section below and add your questions. Move to Uninstall a program and find the undesirable app. Right-click the program you want to erase and select Uninstall. Click the Start button on the left of the Taskbar at the bottom of the screen. Double-click the Add or Remove Programs icon to open a menu. Open the browser and tap Alt+F keys to open a menu. Select More tools for more options and then click Extensions. In the Extensions menu click the recycling bin and choose Remove. Open the browser and tap Alt+T to open the Tools menu. Select Add-ons to access the about:addons menu. Find the undesirable extension and click the Remove button next to it. Quick & tested solution for CalendarSpark removal.